Closed-End Fund Advisors ("CEFA") is a fee-based Registered Investment Advisory firm founded in 1989. Known as "The CEF Experts," Closed-End Fund Advisors has its corporate headquarters in Richmond, Virginia and reflects over 55 years of combined investment experience in closed-end funds ("CEFs") and other investment vehicles. CEFA's primary business is discretionary asset management. As a global manager of managers, we build portfolios for individual and institutional clients, through either direct work with clients or through financial advisors and planners. To learn more about our firm, download our firm's profile presentation. CEFA's global investing utilizes a value approach of reasonable risk-taking, tempered by careful analysis of all the underlying factors before investing in potentially more than 40 markets worldwide. To learn more about these models' investment strategies, visit our investment portfolio models page or contact us to request information about our managed accounts. 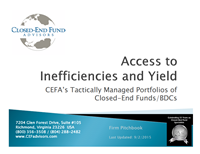 CEF Advisors' 30+ CEF/BDC Indexes: We recently launched 30+ indexes cover the entire closed-end fund (CEF) and business development company (BDC) universe. The indexes cover both bond and equity sector indexes as well as diversified portfolio objective indexes. The indexes are priced daily from our internally collected CEFData.com research system and database launched in 2012. Data will be available on the indexes for additional benchmarking purposes including weighted discount, yield, leverage, duration, beta and other metrics for the underlying constituent funds. The indexes will be rebalanced quarterly. The indexes were developed to help us monitor our client portfolios as well as help our research/data clients and peers better benchmark themselves. The firm's index project can be monitored via: www.cefdata.com/index. We offer a performance table and a data table webpage summarizing each index. Clicking on each indexes' name opens a detailed page containing the following information: 1. Index Methodology, 2. Market Price and Net Asset Value Performance, 3. Discounts, 4. Data Characteristics, 5. Holdings' Asset Allocation, 6. Constituent Funds, and 7. Daily index market price and net asset value pricing. The Scott Letter: Closed-End Fund Report is one of the few closed-end fund industry newsletters to publish interviews with closed-end fund managers. We also cover the most important issues facing closed-end fund investors. CEFA's Closed-End Fund Universe provides weekly data on the complete closed-end fund and business development company universe. A sample copy is available for review as well as a 14-day, no-risk free trial. CEFA's Free BDC Universe Data Page: providing the first central location that we know of, for key BDC data on all US listed public business development companies (BDCs). The data is updated weekly and we will be adding BDC educational resources to help educate investors on the sector and investment structure. Chuck Jaffe, Sr. Columnist for Market Watch, interviews John Cole Scott for the MoneyLife Market Call, April 2, 2019. Often Ignored, Closed-End Funds Have Some Big Advantages - Jane Wollman Rusoff, ThinkAdvisor, November 8, 2018. Looking for Higher Yields? Try Lending Money - Heather Perlberg, Bloomberg, November 6, 2018. Blackstone Lands Interval Funds at Wirehouses - Tom Stabile, Fund Fire , October 31, 2018. Chuck Jaffe, Sr. Columnist for Market Watch, interviews John Cole Scott for the MoneyLife Market Call, October 1, 2018. Why Closed-End Funds Could Deliver a Powerful Income Portfolio Boost. John Cole Scott on The Street Webcast, September 17, 2018. BlackRock merges closed-end New Jersey muni funds. John Cole Scott quoted on Fund Action., June 12, 2018, by Noah Zuss. John Cole Scott quoted on Kiplinger. 3 Ways to Earn 5% to 9% from Closed-End Funds, May 10, 2018, by Tom Petruno. John Cole Scott interviewed on Seeking Alpha. What's So Great About CEF Investing, April 22, 2018. John Cole Scott quoted on Kiplinger. Earn Up to 9% With These Closed-End Funds, February 1, 2018, by Ryan Ermey. Chuck Jaffe, Sr. Columnist for Market Watch, interviews John Cole Scott for the MoneyLife Market Call , December 15, 2017. Investius: Beyond Income, December 3, 2017. John Cole Scott quoted on Bloomberg. This Is the Low-Profile, High-Stakes World of Venture Lending, November 2017, by Jon Asmundsson. Investius: Risk. John Cole Scott interviewed by Chris Allen, November 12, 2017. Investius: Alternatives. John Cole Scott interviewed by Chris Allen, November 5, 2017. Investius: Global. John Cole Scott interviewed by Chris Allen, October 30, 2017. Investius: Distributions. John Cole Scott interviewed by Chris Allen, October 16, 2017. Investius: Discounts. John Cole Scott interviewed during The CEF Association Event, September 20, 2017. Chuck Jaffe, Sr. Columnist for Market Watch, interviews John Cole Scott for the MoneyLife Market Call , June 27, 2017. John Cole Scott quoted on Kiplinger. 29 Ways to Earn 1% - 10% on Your Money in 2017, June 2017, by Daren Fonda. CEF Advisors Provides Data for CEFs and BDCs as of 3/31/17 and Quarterly Research Replay and Slides, April 26, 2017. Managed Management: A Conversation With A Closed-End Fund Advisor, Pt. 2, March 7, 2017. Managed Management: A Conversation With A Closed-End Fund Advisor, Pt. 1, March 6, 2017. Chuck Jaffe, Sr. Columnist for Market Watch, interviews John Cole Scott for the MoneyLife Market Call , February 9, 2017. CEF Advisors Launches 25 Indexes to Cover the Entire $265 Billion US Listed Closed-End Fund (CEF) and Business Development Company (BDC) Universe, February 9, 2017. 11 REIT Plays for Income and Inflation Protection. John Cole Scott quoted in Barron's Article, January 21, 2017. CEF Advisors Provides Data for CEFs and BDCs as of 12/30/16 and Quarterly Research Replay and Slides, Januray 19, 2017.